ABB says it is expanding the upper limit of storage integrated into microgrid projects. ABB has raised the upper limit for microgrid renewable-energy penetration without storage. Research by the company suggests up to 50 percent intermittent generation could be admitted to microgrids without needing storage, provided that automation systems are in place to keep the grid stable. Traditionally, the upper limit for renewable energy penetration in microgrids without storage has been around 40 percent of total load. ABB looked at a range of microgrid scenarios, including low-penetration setups where renewable energy covered up to 30 percent of peak load, medium penetration at 50 percent, and high penetration at 100 percent. “When you look at a low-penetration system, if you design and maintain it properly, you don’t need much more capex upfront,” said ABB’s microgrid global sales manager, Pablo Astorga, at the Microgrid Global Innovation Forum in Barcelona this month. Beyond this level, it becomes imperative to have an automation system to cope with renewable energy penetrations of up to 50 percent of peak load, Astorga said. In a typical microgrid, that might amount to about 30 percent of all megawatt-hours coming from wind, or 15 percent from solar. Even at this level of penetration, it is likely that a portion of the total load will be covered by diesel. A 100 percent coverage of peak load in megawatt terms equates to roughly a 70 percent contribution from wind in terms of megawatt-hours, or 50 percent from solar. The exact point at which storage might be required will vary based upon the load profile. But “if the project is properly designed and optimized in the right way, up to 50 percent, you could run with just an automation system,” said Astorga. He also noted that the findings for microgrids were not applicable to considerations of renewable energy penetration levels in traditional power grids. “I do not think we can generalize for the larger grids, but I do think a higher penetration level [than now] could be accepted without chaos,” he said. Choosing the right renewable energy integration strategy for microgrids is important, ABB says, because poorly integrated intermittent energy sources can result in an increased number of genset stops and starts and frequency or voltage variation. This tends to increase the need for spinning reserves and results in heavier reliance on diesel generation, the opposite of what is sought in most hybrid microgrid projects. With the right integration plan, in contrast, “technically you can go fossil-free, but that is not always the optimal case,” said Astorga. In terms of levelized cost of energy, the sweet spot tends to be between 60 percent and 80 percent coverage from renewable sources, he claimed. ABB has a number of microgrid projects with storage. 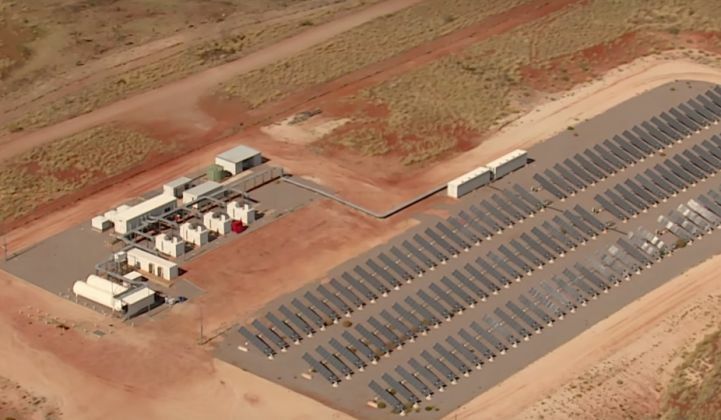 In Western Australia, for example, its Marble Bar hybrid power plant features four 320-kilowatt diesel gensets alongside a 300-kilowatt PV array and a 500-kilowatt PowerStore flywheel storage system. The solar array supplies 60 percent of the grid’s daytime electricity demand, saving 405,000 liters of fuel a year. At the DeGrussa copper and gold mine, also in Australia, ABB is integrating a 10.6-megawatt solar plant and battery system with existing gensets to cut diesel consumption by 5 million liters a year, or 20 percent, from 2016. “The obvious reason why we are putting more and more renewable energy into microgrids is that the cost of renewables is coming down and the cost of fossil fuel is very volatile,” said Astorga.